The Rockbox Pro cajon is very responsive with a deep punchy bass and crisp bright resonant snare. With a greater tonal range than the standard model and the ability to attach a foot clicker and or side clicker attachments the Pro is the perfect drum for all occasions. The Rockbox Pro can easily support up to 150 kg in weight and can be played on all sides. It comes fitted with the standard Pat pending designed Rockbox snare system and Rim-shot. 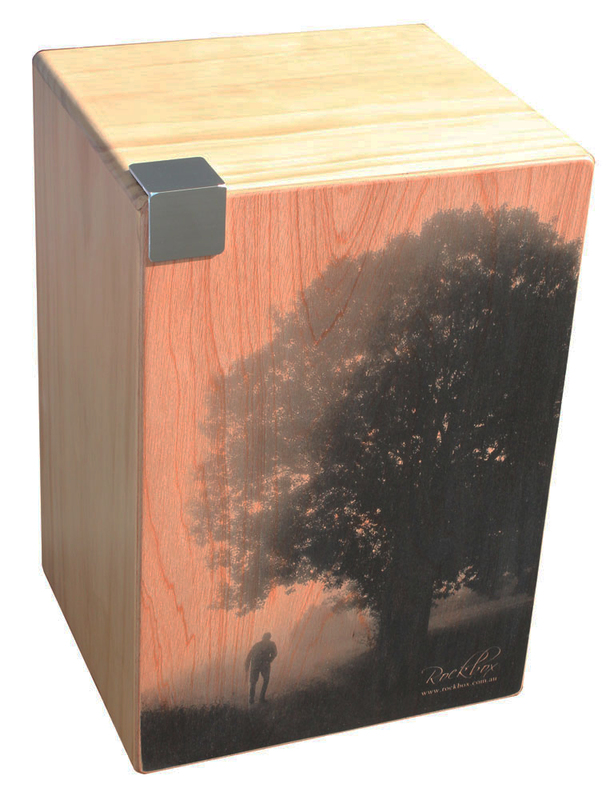 The Rockbox Pro cajon comes with a 3 year Workmanship warranty. The new logo uses a very new technique which prints the image directly upon the timber, similar to a tattoo. also allowing for the grain of the timber to show through the image making each drum unique. Like tattooing the ink is absorbed into the grain of the timber making it very permanent. Same sound, size and look as the Dovetail model Rockbox, minus the dovetail joints = a more affordable price.